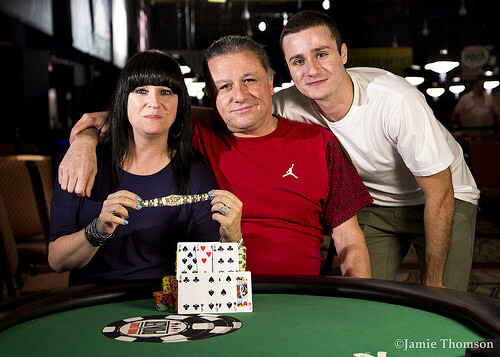 Eli Elezra won this third career gold bracelet at the World Series of Poker. The Israeli-born poker pro, now residing in Las Vegas, put on yet another trademark performance in the $1,500 buy-in Seven-Card Stud event, staging various comebacks on multiple occasions over the course of the three-day tournament to seize one of the most fulfilling victories of his long and illustrious career as a high-stakes cash game pro, albeit with significant tournament achievements, as well. This year’s $1,500 buy-in Seven-Card Stud at the 2015 World Series of Poker drew 237 entries. The prize pool amounted to $441,450. Elezra pocketed $112,591 for first place, but the prize money seemed to be the least important thing about this victory. Elezra, whose previous victories at the series took place in 2007 and 2013 took special pride in the Seven-Card Stud title, which he views a one of poker’s most skillful games. Elezra also noted that since many experienced players participate in the Stud event, defeating such an accomplished field is a matter of special pride. Seven-Card Stud has been a part of the World Series of Poker since 1973 and a part of the American poker tradition for a lot longer than that. Dating back to its origins in 5-card stud, which was played in the 19th Century, its close cousin 7-Card Stud was one of the most popular poker games in the United States, until the Texas Hold’em craze took over a decade ago. The game doesn’t draw the big crowds it used to, but it still has its loyal followers – and on this night no one was more dedicated to the game than Elezra. Elezra’s last victory here at the Rio in Las Vegas took place when he came from behind to defeat Daniel Negreanu. Like that memorable finale, Elezra had to come from behind in this event also, particularly during the heads-up phase against Benjamin Lazer, who came in second for the second time in his career. Lazar also took the runner up spot in a tourney played back in 2012, making the gold bracelet an elusive prize. Meanwhile, Elezra now has three titles to go along with widespread popularity as one of the game’s most congenial and well-respected players. Usually talkative with others and commonly joyous at the table, Elezra remains a throwback to an earlier era when poker wasn’t about cards as personalities. Like the game he won, also an old guard competition with rich traditions, Elezra used every trick in his bag of experience to outfox his opponents. 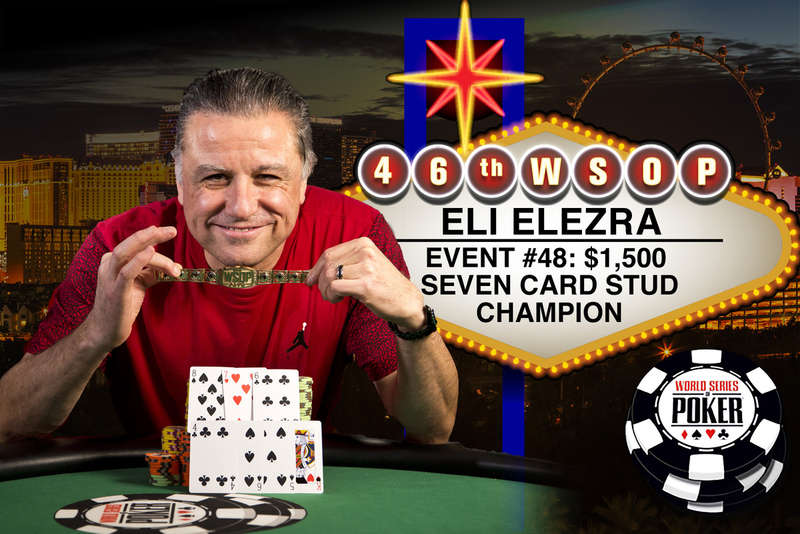 Aside from his widely-shown appearances on high-stakes poker shows and achievements at the WSOP, Elezra is a full-time cash game player who participates in some of the biggest cash games in Las Vegas. He’s been on television dozens of times and is easily recognizable as one of the table’s most talkative players and best storytellers. However, behind the friendly smile is a fiercely competitive player who loves to play and win. Three of the eight players at the final table were former gold bracelet winners -- including Elezra, Allen Cunningham (who finished 3rd), and Matt Grapenthein (who finished 8th). 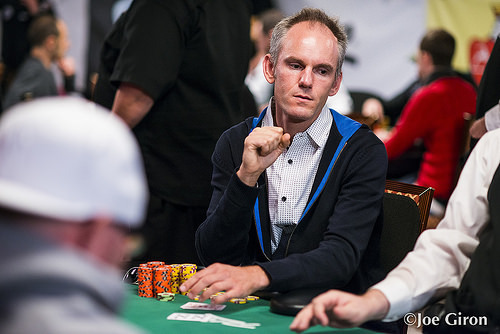 Aside from the final table finishers, other notable gold bracelet winning players who cashed included – Eric Buchman (10th), Vladimir Shchemelev (14th), Barry Greenstein (16th), Brendan Taylor (21st), Bill Chen (23rd), Perry Friedman (34th), and Mike Leah (40th). Tom McCormick, a.k.a. “The Shamrock Kid” cashed in this event, which marks his 51st career in-the-money finish. 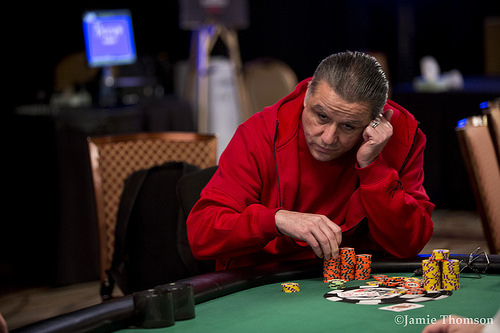 At the WSOP, only Tony “Top Cat” Cousineau has more cashes without a gold bracelet victory. Linda Kenney-Baden, the famed defense attorney from New York City (defended Phil Spector in murder trial) cashed for the second time in a WSOP event in this tournament. The gender breakdown of participants was 303 males and 24 males. The average age of participants was 48 years, older than the customary entrant by about 13 years. In fact, this is the oldest tournament demographic, other than the Seniors Event(s). Players ranged in ages from 21 to 81. There were players from 19 countries represented. Ten years ago, Seven-Card Stud was the most popular game in casinos on the East Coast, primarily in big gambling destinations such as Atlantic City and Foxwoods. In fact, SevenCard Stud games outnumbered hold'em games several times over. Some East Coast casinos did not even spread Hold'em, since Seven-Card Stud was the game of choice. But everything changed in 2003, most crediting (or blaming) the cosmic shift on Chris Moneymaker's victory, which instantly created millions of new players curious about No-Limit Hold'em. Seven-Card stud has been steadily declining in popularity since then. However, it remains popular enough to merit inclusion on the WSOP schedule. Its cousin - Seven-Card Stud High-Low Split, a.k.a. Eight-or-Better, is actually more popular now as a tournament game. Seven-Card Stud made its debut at the 1973 WSOP. “Puggy” Pearson was the very first stud champion. The Ladies World Poker Championship featured Seven Card Stud during its first 20 years. It switched to No-Limit Hold’em due to the reversing popularity of games. Six players in WSOP history own two gold bracelets in Seven-Card Stud. They are Johnny Moss, Bones Berland, Marty Sigel, Ted Forrest, Mel Judah, and Rod Pardey Sr.
Two players own three WSOP gold bracelets in Seven-Card Stud – Artie Cobb and Men “the Master” Nguyen. Note: Artie Cobb's fourth gold bracelet came in Seven-Card Stud High-Low Split, which more precisely gives him four wins in Stud-related events. Other prior Seven-Card Stud winners include two poker legends -- Stu Ungar and Chip Reese. Benjamin Lazer is the bring in showing and Eli Elezra calls. On fourth street both players check. Lazer bets out on fifth street, only to see Elezra raise. Lazer has 100,000 left and three-bets, and Elezra puts the last bet in so Lazer is all-in. Elezra turns over but Lazer is ahead with . Elezra catches the seven on sixth street and Lazer catches the six. The dealer pitches out the seventh street down cards and Elezra immediately flips over the , leaving Lazer drawing dead and guaranteeing Elezra the victory, the $112,591 first place prize money and most importantly, his third WSOP gold bracelet! Eli Elezra brings it in with the and Benjamin Lazer completes with the . Elezra calls. Lazer bets fourth and fifth streets and Elezra calls. On sixth, Lazer bets all in and the hands are turned up. Lazer is ahead with his pair of threes but Elezra has plenty of outs. Seventh street brings Lazer the for two pair and Elezra now needs a straight to win. Instead, Elezra gets the and Lazer drags the pot for a much-needed double up. The players are forgoing the regularly scheduled 20-minute break and play will continue uninterrupted. Lazer bets fourth street and Elezra raises. Lazer calls and then calls a bet from Elezra on fifth. Elezra checks sixth street, then calls a bet from Lazer. On seventh, Elezra is first to act. Elezra squeezes his down cards and takes a look, then fires a bet of 60,000. Lazer goes into the tank for thirty seconds and nods, then folds. In a heads up match that is mostly small pots, rarely going past fourth street, there is still the occasional exception. Benjamin Lazer brings it in with the and Eli Elezra completes with the . Lazer calls. Elezra checks fourth and Lazer bets. Elezra then check-raises and Lazer calls. On fifth street, Elezra bets and Lazer calls. On sixth, Elezra picks up a pair of kings and bets. Lazer has seen enough and folds. Elezra takes the betting lead on fourth and bets 30,000. Lazer raises and Elezra calls. On fifth, Elezra check-raises Lazer, only to have Lazer three bet. Elezra calls and then check-calls another bet on sixth street. Elezra checks seventh street dark. Lazer bets and Elezra takes his time looking at his last down card before check-raising. Lazer goes into the tank, and then looks at Elezra and says something that's mostly drowned out by the rail from the secondary feature table, but we hear the words "full house." He missed his full house? He can beat anything but a full house? We don't know but Elezra responds, "Then lay it down." Another fifteen seconds pass and that's just what Lazer does by tossing his hand into the muck. Eli Elezra has wrestled away the chip lead from Benjamin Lazer after two big hands. Firstly, Elezra is the bring in and calls after Lazer completes. Lazer bets fourth street and Elezra calls, before both players check fifth street. Lazer bets sixth street and Elezra calls but on seventh, Lazer leads out only to be met with a raise by Elezra. Lazer calls and Elezra has made a full house on seventh street. Lazer unhappily folds. A couple of hands later, Elezra is the bring in again and this time he raises after Lazer completes, only to see Lazer three-bet. Elezra calls, and Lazer bets fourth and fifth with Elezra calling. On sixth, however, Lazer elects to check-call, and on seventh he does the same, commenting that the hand is sick as he has blockers to a straight, but Elezra has made a Broadway straight to win that pot and take the chip lead. Benjamin Lazer brings it in with the and Eli Elezra completes with the . Lazer raises and Elezra calls. Elezra bets every street through sixth and Lazer calls down. On seventh, Elezra bets dark and Lazer calls. Elezra turns over for a broadway straight. Before the dinner break, Elezra said that, "Whoever makes the most straights is going to win this tournament." He may be right. Heads-up play started with Benjamin Lazer winning most pots on third or fourth street, partly helped by Eli Elezra being the bring in approx. 80% of the time. Recently though, Elezra has been firing back, winning a couple of pots by raising on third street after Lazer completes, and in one particular hand Elezra makes it two bets showing after Lazer completes showing , and the pair head to fourth street. On fourth street Lazer leads out for one bet and Elezra elects to call. On fifth street, however, Elezra takes the lead with an open pair of tens and bets. Lazer calls, and retakes the lead on sixth street when he pairs his jack. He elects to check, and Elezra instantly bets. Lazer calls, and on seventh street Elezra is holding chips out ready to bet as Lazer squeezes his down card before checking. Elezra opens his hand to drop the chips in and Lazer goes into the tank before folding. Allen Cunningham has just been eliminated from the tournament via a one-two punch from Eli Elezra. In the first hand between the two, Elezra filled a flush on seventh to double through Cunningham. The two players essentially traded stacks: Elezra finished the hand with 455,000 to Cunningham's 123,000. Elezra fills his straight on seventh and sends Cunningham to the rail. Cunningham finishes in 3rd place for $44,846. Benjamin Lazer is the bring in showing . Allen Cunningham completes the bet showing and Lazer calls. Cunningham is first to speak on fourth street and bets, with Lazer calling. This repeats on fifth street, but both players check on sixth and head down seventh street. Cunningham bets on seventh, but Lazer quickly makes it two bets. Cunningham goes into the tank for nearly 3 minutes, but eventually lays it down. Eli Elezra completes the bet on third street showing and Benjamin Lazer is the only caller showing . On fourth street Elezra bets and Lazer calls. This action repeats itself on fifth street, but on sixth street Elezra bets and Lazer raises. Elezra calls and the pair see seventh street. On seventh street Elezra checks and Lazer bets. Elezra calls, only for Lazer to turn over for a straight. Elezra looked upset as he mucked, flashing the for trip kings as he counted what remained of his stack, which was 250,000. Eli Elezra brings it in with the and Allen Cunningham completes with the . Benjamin Lazer raises with the and Elezra folds. Cunningham calls. Lazer bets fourth and fifth streets and Cunningham calls. On sixth street, Cunningham picks up a pair of nines and bets. Lazer raises and Cunningham calls. Both players check seventh street. "You have an eight?" Cunningham asks. Lazer nods and turns over for trip eights and Cunningham mucks. Allen Cunningham completes showing the and Eli Elezra, who is the bring in showing makes it two bets. Cunningham quickly makes it three bets and Elezra calls. On fourth street it is Elezra to act first and he bets, with Cunningham calling. Cunningham then pairs his door card on fifth and leads out for a bet, only to see Elezra make it two bets. This does not deter Cunningham, however, as he makes it three bets and Elezra calls. On sixth street Cunningham bets and Elezra calls, and on seventh street Cunningham bets again, but this time Elezra spends some time in the tank before folding, sending the pot to Cunningham. With the action on third street, Allen Cunningham completes the bet. Benjamin Lazer makes it two bets to go, only for Cunningham to put three bets in. Lazer calls and the pair see fourth street, where Cunningham bets and Lazer calls. This action repeats itself on fifth and sixth street, and the dealer pitches out the seventh street down cards. 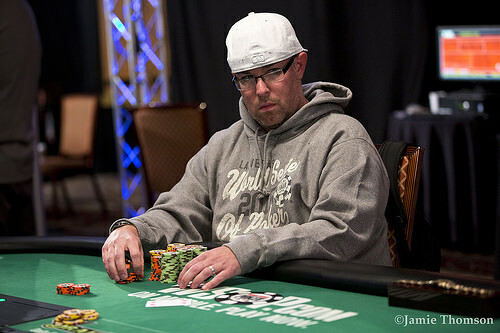 On seventh street Cunningham bets again, leaving only 8,000 chips behind. Lazer calls and Cunningham rolls over for kings up, which is enough to get Lazer to muck his hand and mostly double up the five time WSOP bracelet winner. Benjamin Lazer brings it in with the and Eli Elezra completes with the . Lazer calls. Elezra bets fourth street and Lazer calls. On fifth, Lazer takes the lead and bets his pair of sevens. Elezra calls, then picks up a pair of kings on sixth street. Elezra checks and Lazer bets. Elezra check-calls sixth and then checks seventh street dark. Lazer checks seventh and Elezra turns over . "I don't know how I missed," Lazer says, turning over for two pair that included an open-ended straight flush draw.